WHEN IT COMES TO OVERWINTERING GERANIUMS, I refuse to be saddled with tired, old, monster-size plants. I want fresh, young geraniums that are eager to grow, and which are small enough to serve decorative duty in the window garden. Do you want what I want? Then let me show you how, exactly, to prepare these popular summer plants for winter-beauty indoors. 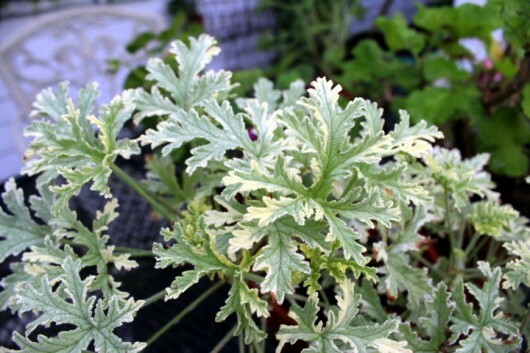 Mid-August — or at least 6 weeks before the first expected frost — is a good time to restore and propagate zonal and scented-leaved geraniums. This gives the plants ample time to recover from root-trauma, and for cut stems to form roots before the big outdoors-to-in transition. When you are dealing with a zonal geranium that has grown all summer (such as ‘Puritan White’, above), the first step is to cut the plant back to within an inch of its life, or to the point where the lowest leaves can be found. Be brutal here. This is what your plant should look like after removing nearly all of the top growth. Next, knock the geranium from its pot. To do this in a “professional manner,” place one hand over the top of the plant, where it can support the soil and top growth. Then invert the pot, and, holding the bottom of the pot with your other hand, bang the rim against a hard surface. Don’t be delicate here — bang firmly! The plant will pop right out of its pot, and into your waiting hand. You will probably discover the plant is horribly root-bound. We’re going to fix this. Using a serrated knife, slice off two-thirds of the roots. The amount of roots you remove should be in direct proportion to the now-missing foliage. 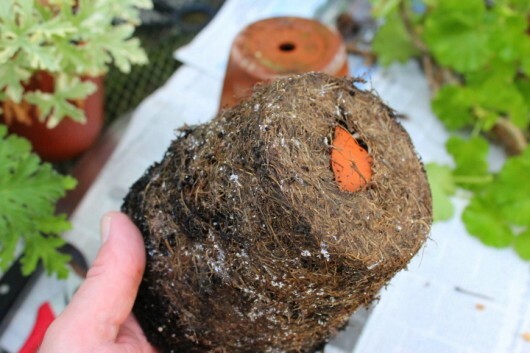 Toss the severed roots onto the compost pile. Then, as pictured above, make vertical cuts to slice through soil and roots. 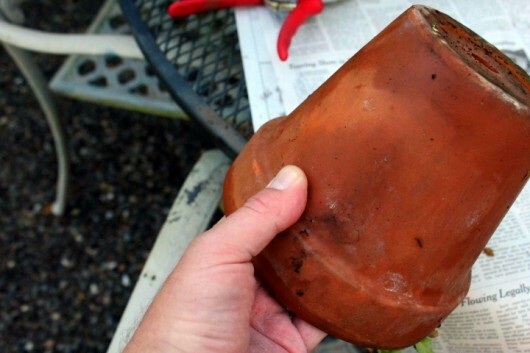 The goal is to be able to center the plant in its old pot, but with a one-half or one-inch gap between the existing soil and the walls of the original pot. I hope that last above sentence made sense to you. Now take a good look at your geranium. Do you see any dead or rotting stems? Cut these off. You’ll need only three or four stems which show signs of life. Then add fresh potting mixture to come approximately half-way up the sides of the pot. Now center the plant in its pot. 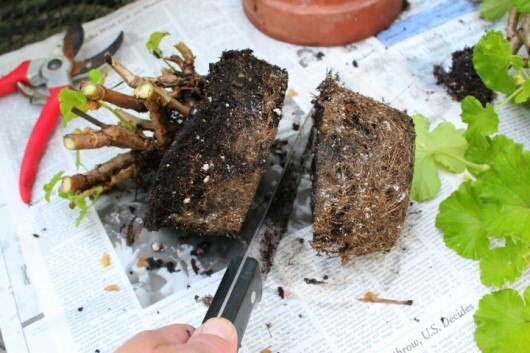 If centering seems impossible, just cut away more roots and soil to create a rounded shape. And then firm it down with a paint stick, a Popsicle stick, or a plant label (as above). 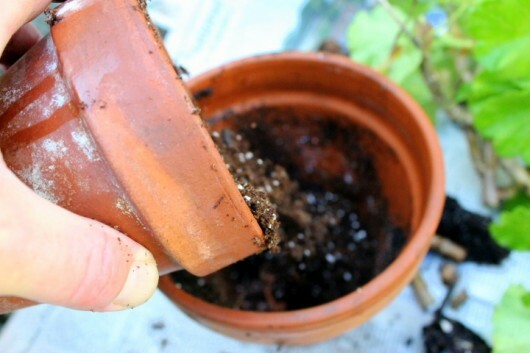 Properly potted, there will be a one-inch opening between the soil surface and the top of the pot to allow for water. Soak the plant thoroughly, until excess moisture escapes through the drainage hole. Rinse off any soil which is clinging to the leaves. And that’s it! You now have a newly-restored geranium which will give you pleasure all winter and beyond. Now, what to do with all the stems we cut ? Well, each of these can become a new plant. Trim the stems to 3 inches in length. 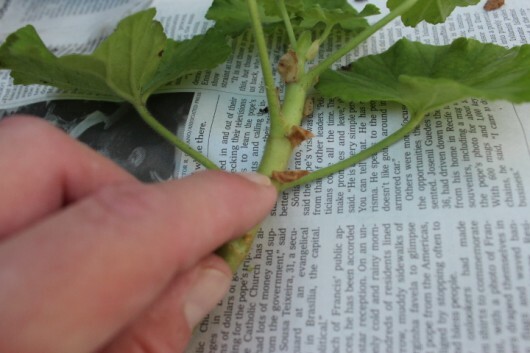 Then set the stems aside for a few hours (or even a few days) to permit their cut end to dry, or “callus.” A callused cut is not likely to rot. 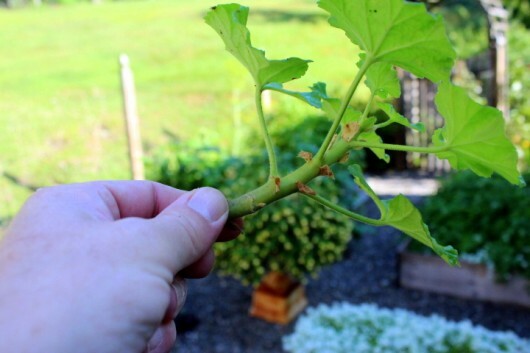 Remove the lower 2 inches of leaves from each stem. Remove also the stipules, or little flaps along the stem. These can rot in damp soil. No photo for these next three steps, because I don’t think you need them: Take a 4-inch clay pot, and place a piece of broken pottery over its drainage hole. Then fill the pot with fresh mixture. 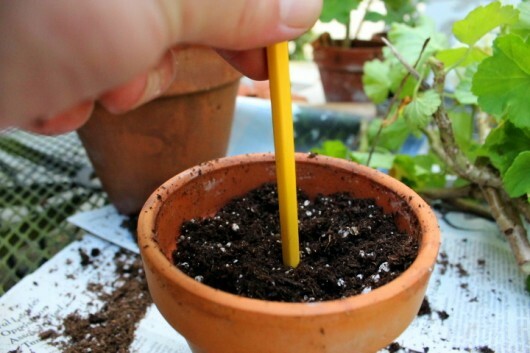 Insert a pencil in the center of the soil, to a depth which approximates the length of your cutting. And then firmly pack the soil down with your thumbs. Or “thumb,” if you are holding a camera while you work. 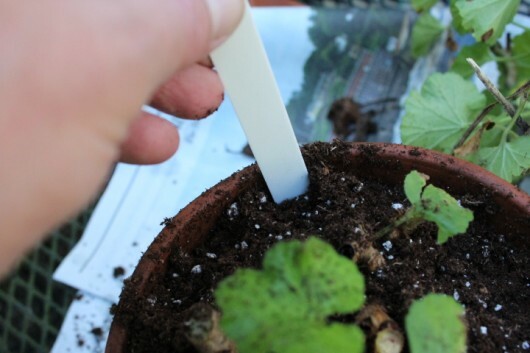 If, after pressing down, the soil level drops more than one inch below the top of the pot, just add a little more mixture and re-adjust the stem. Water the plant thoroughly (until excess drips through the drainage hole). Should signs of wilting occur, simply mist the leaves once or twice each day until roots form. You will know that your cuttings have rooted when new growth becomes evident. Set the plant in a bright but sunless location outdoors. Once roots have formed, you can give the youngsters a position that receives half-day sun (or full-day sun in a window garden). 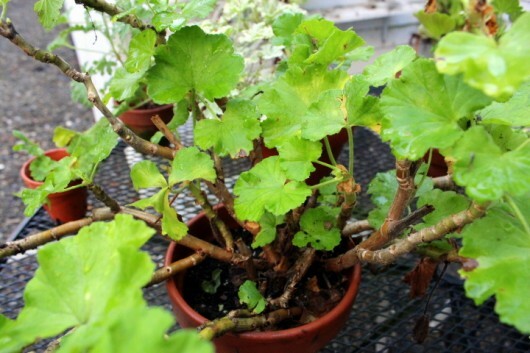 And by the way, you can use these same restoring and propagating procedures for scented leaved geraniums. Sadly, these are becoming rare lately, so propagating them is the only way sure way to have them from year to year. Pictured above is my rose-scented ‘Lady Plymouth.’ You can crush the leaves of this variety, and add them to your bath water. You can also steep the leaves in full-fat milk, and then use the milk to make scented icing for cakes and cupcakes. 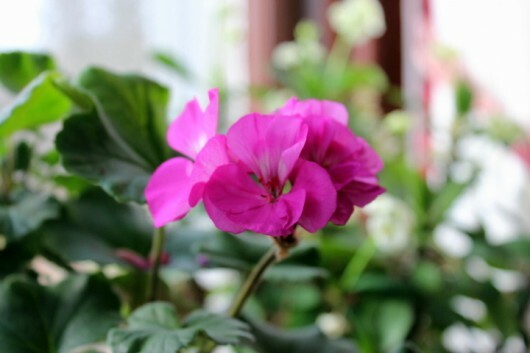 If you browse the houseplants category on this website, you’ll find pictures of scented-leaved and big-flowered geraniums displayed in my various winter window gardens over the years. In December, 2011, lavender-pink ‘Americana’ made a handsome sight in my Music Room window. ‘America’ looks lovely in my Herb Garden, too. Here, it recently attracted a hummingbird moth. Indoor Culture: To achieve indoor success, give your geraniums all the direct sunlight an east or south window will afford. Restored plants can bloom as early as December, while plants grown from cuttings usually won’t set buds until the days lengthen in February or March. Pictured above: Zonal, scented-leaved, and fancy-leaved geraniums in my Library/Den window in February, 2008. No east or south window for you? Place the plants under fluorescent lights. Illuminated for 16 hours per day, I can tell you that zonal geraniums will bloom in winter almost as well as they do in summer. Once the plants are growing, I encourage bloom with a high-phosphorous, low-nitrogen plant food. The window garden subjects are fed at the rate of one 1/4 teaspoon formula per gallon of water. I increase the food to one 1/2 teaspoon for the window garden plants, because they receive such long hours of light. Well. I hope this tutorial was useful to you in some small measure. Perhaps you will let me know by leaving a comment. As always, your words are the sunshine of my life. I may have to try this!! I put my large pot of geraniums in the garage last year over winter…occasionally watering and they came back in spring. Had no idea I could have them blooming in the house in winter. My windows would be facing northwest…guess I will need a light. Phosporus is not good for the ocean. If I remember correctly it depletes oxygen. In 1993 a law was passed that banned it’s use in washing powder. I wonder if you use phosporus in a plant if it can be present in the pollen and hurt pollinators like bees. For sure it has a negative impact on the ocean and thus ocean life. Sorry for the gray cloud. No sunshine here…. I think your plants are beautiful and your page has added immeasurable sunshine to my life…. this was very useful to me! I have a geranium that was given to me last year when my brother passed and I brought it in for the winter. It survived and is still growing and blooming but not very well. I will definitely be doing this to it soon. Thank you, Kevin. I already have my petunias rooting for winter bloom. (VERY exciting.) 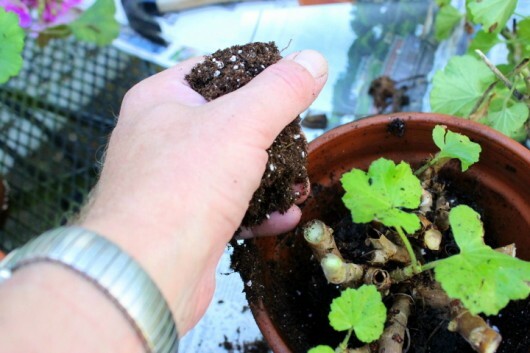 And I will now revive some very prolific (but somewhat tired) geraniums, as per your simple, friendly, instructions. I so love this blog. This is a good article on the effects of nitrogen and phosphorus on the ocean and ocean life. A natural source of nitrogen is rainwater and for gardeners that have gutters there are ways to transport this water to your garden. I’m sure with adequate thought and planning something can be invented that would not only collect rainwater but transport it to a large garden. It’s kind of hard to decide between beautiful plants and ocean life but think dolphins and manatees and this will help. With this I will stop because I respect an individuals’ right to garden without being lectured…. You always come up with projects that are doable in scale and scope, and can be enjoyed over a several-month period. Thank you for all the inspiration. Hi, Mr. Kevin! I’ve already got some really good geranium slips going and plan on doing even more this weekend. I tried the petunia cuttings and did everything you said but none of them made it. 🙁 Despite keeping them moist and misting them daily, every single cutting dried up and died on me. The only difference with the petunias vs. the geraniums is that I kept the geraniums outside and brought the tunies inside. Do you think I should try more petunia slips but keep them outside for awhile? Hi Tris – Yep, let the petunias root outdoors in a bright but sunless location. Excellent! I have several geraniums, some from my mother who passed away in 1995. Every winter I just bring them inside, put them insouth facing windows, and water once a month. They keep blooming, but they get very tall and not so pretty. I will definitely give this a try. Thank you! Now I know what my poor geraniums need. Thanks! I am a avid Geranium lover and would like to find some scented plants to grow. Do you have any suggestions where to purchase them? I have in the past suffered with little gnats on my houseplants during winter. Once having to toss all the geraniums and their soil because it was awful. Recently I found a product made by”Hot Shot” that can hang or sit that emits a vapor to kill flying and crawling insects that works great. Thought I would share! Kevin, should I add the phosphorous every time I water? I love your newsletters and site. Especially the detailed photo instructions. Thanks so much. Good morning , Kevin….I got my 2 shelves cut for my south facing computer room window last week….now i think I will have to go back and get more cut some for the east facing living room for the added geraniums….one can never have enough flowers blooming in the house over the winter….and, of course, that gives us plants ready to go for the next spring………..thank you so much…..love this project…can hardly wait to see how it turns out! Hi Jeanne – I’ve found the Zebra plant (Aphelandra squarrosa) to be tricky to grow –it demands the high humidity of a jungle! Leaves can wither if the soil is permitted to dry out between waterings. Better to keep the soil consistently moist. Hi Bev Grosse – My plants seem to do better when I feed them with every watering. Jo-Anne – Congratulations — I’m sure you’ll enjoy your window garden(s)! I’m very excited about this post, but then most of your posts excite me. Each year I do bring in my geraniums and they have gotten straggly over the years. So, your lesson on doing it right makes a big difference. Thank you so much. 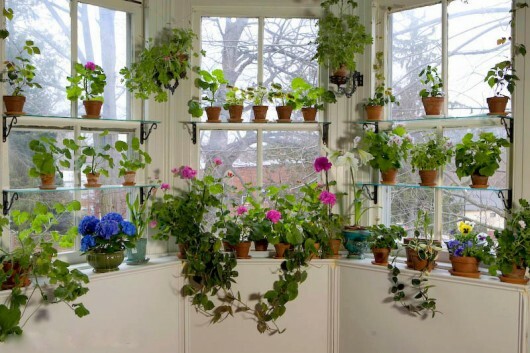 This is very helpful because my geraniums get too stringy in the window in the winter. I have not fertilized. I am also encouraged by JoAnne and Sandra because they live in the same sunless region as I do. (Seattle.) This month I will cut them back and take cuttings, and then I will fertilize. But not enough that will drain off and run into the ocean. I will keep it in the pot. In the past I found that if the geraniums bloomed during the winter, they were extremely slow to bloom once I returned them to the garden in the summer. Have you had this problem? Also, I will be bringing in geraniums that have been in the ground. I’m assuming your process works the same as if they have been in pots. I have an ivy leaf geranium that I would like to try to propagate over the winter as you describe. I was also wondering, do you pinch the cuttings back as they grow to keep them bushy, or is this not necessary? Thanks for all the great tips and news! 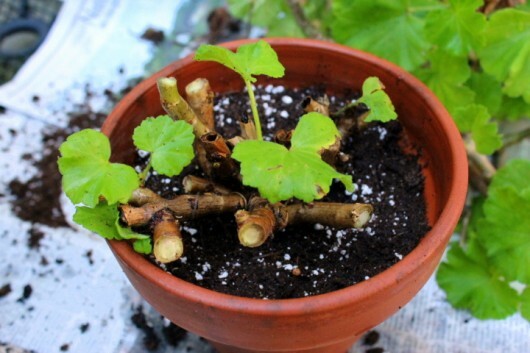 great post as always, I would like to try to keep my geraniums for next summer- should I take cuttings now for winter blooming, (I’m now obsessed with the idea of red geraniums on the Christmas table), but then also cut back the mother plants and pinch off any winter blooms to make sure they bloom again next summer? Awesome! Thanks so much! Looking forward to doing this your way this year. I’ve been bringing in a giant geranium and a giant leggy scented geranium I’ve had for years.. I love them but they’re such a pain to find homes for in the winter… This should fix that! I want to know about that knife you are using to slice the rootball! It looks enormous. Be careful! The medium sized knife I use in the garden was removed from a parolee arrested by my husband many years ago. This knife had a secret compartment hidden in the handle, presumably to hold contraband of some sort. I have abused this tool at length and it still does the job. I’m going to look for it now to work on my geranium, and don’t get in my way. I’m lucky. I am in SW Colorado (13,800 ft elevation) and my geraniums are quite happy on the deck from mid-June to mid-September. Then, I take them with me to southern Arizona and they spend the fall and spring there on my patin. During the “winter” months in Arizona, they are either covered well on the patio or join me in the kitchen. I constantly make new plants from these. In 2002 my Mom visited us in Colorado and brought me a pink geranium from Ohio. It is still thriving and since she passed away in 2012, it is a nice on-going reminder of her. Geraniums were a “welcome” gift when people moved to these Rocky Mountain early mining towns; ladies would take a flowering start to a newcomer. They will bloom all winter if kept in a sunny window. Thank you so much! I have always wanted to winter over my geraniums and this year I have a very special one that my Mother loved on. Mom passed away 1 1/2 months ago and while I am so sad, she still inspires me. Thank you for also inspiring me today. Oh, my question is, at what point do you bring them indoors for the winter? Maria – Good news for you. Through propagation efforts, your mother’s geranium will live forever. Beverly – I use that big serrated knife for all my “plant surgeries.” But I want the knife that you have. A secret compartment in the handle? Cool. Hi Maria – I bring mine indoors at the end of September, and before frost. And please stay tuned — in a week or two, I’ll do a complete post on the garden-to-house transition. Great article. I’m going to try this technique. I am wondering if the same procedures might work for bringing potted rosemary and lavender here in Alaska. They are beautiful on my deck, and I have been unsuccessful in transitioning them inside before. 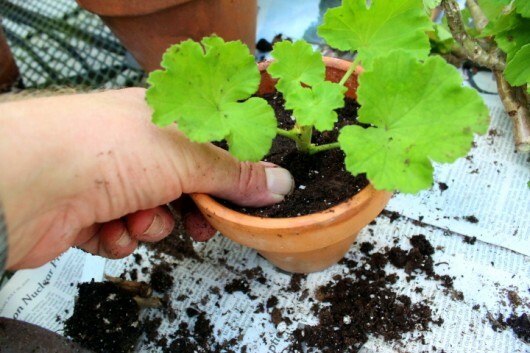 Thanks so much for the steps by step propagation method for geraniums, Kevin. Looking forward to giving it a try. Thanks for the info to locate scented geraniums, and all the tips on enjoying geraniums all year. Thanks Kevin–I will definitely try your method. In the past I’ve overwintered geraniums by uprooting them and keeping them in a paper bag in the garage, then repotting and cutting them back in March, keeping them on a south facing windowsill until last frost. This works fairly well–sometimes–but your method sounds even better. And we get to enjoy them all winter long as well 🙂 Your blog is a highlight of my week. Great article. I have tried rooting geraniums in the past with mixed success. Rot was my biggest problem. I never tried letting them get a callus but I will definitely try that this year. I’d not been able to keep geraniums alive past May here in AZ (probably because of the heat) but will try your method starting in late March/April when the plants are still strong and temperatures below 100. I had some beautiful dark pink geraniums that ended up on the compost pile this year. Love scented geraniums too but haven’t been successful with those either. I’ll share a tip I read in Mother Earth news: if you do not have chards/gravel for the drainage hole on your pots, used coffee filters work well and can be dumped on the compost pile ( I use non bleached filters). Lastly, what a beautiful photo of the moth! Thank you, thank you, thank you for this tutorial, Kevin. I love the “frugality” aspect of it! Free plants for next Spring! All the things you teach and tell us about on your web-site are not always new ideas, but ones that have somehow fallen by the wayside in our hurly-burly, faster-faster culture. I like reviving some of the simple, economical practices of youre. Thanks for your help in doing so. Have a wonderful week. Play as much as possible! I’ve been doing this with my geraniums for a few of years now and it’s great to have plants ready to go in the gardens the following Spring. 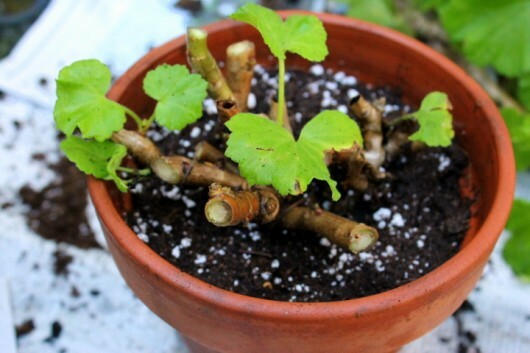 If your plants get a little leggy over the winter, go ahead and take more cuttings and pot them up too. This will help the plants get bushier and give you even more plants. Thank you, Behold, for sort of answering my question about pinching for bushiness–I guess Kevin did not see my question or did not think it was worthy of a reply (too bad I am not Joan Crawford!). Your idea of rooting what you “pinch” off is even better in that you will end up with more flowers. Thanks! Sara – So sorry I missed your question! With cuttings, I pinch out the first new growth to encourage branching. As for the ivy-leaved geranium, or Pelargonium peltatum, I’ve overwintered this one many times. Give it the same treatment as described above — remove most of the top growth, and an equal proportion of roots. Then repot in fresh mixture. 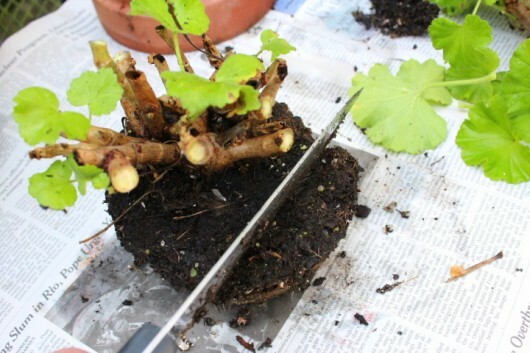 You can root cuttings of this fine plant, too. Cutting back any of these plants will cause new side-shoots to form. Admiring the time and effort youu put into youur website and detailed information you provide. Thanks for the geranium-rooting tips 🙂 I’ve become so lazy with my lovelies that I’ve been rooting some of them in yogurt cups full of water–which also makes me a mosquito breeder. Time to clean up my act! I tried to sign up for your newsletter but it would not accept any of the crazy words you have to type in. Can you add me to your list? Susie – Your wish is my command. I just thought I’d share a few sources of scented pelargoniums (geraniums) I’ve ordered from scentedgeraniumsofne.com in the past with good success. I have recently discovered geraniaceae.com and have read glowing reviews of them. They have an amazing selection of scenteds and other pelargoniums and geraniums, including some really lovely blue varieties. Their plants are said to be suprrisingly large and well-established, sometimes blooming when they arrive. Colonialcreekfarms.com of Georgia also looks like a good source of scenteds. I have several scenteds struggling along in their pots. Would mid winter be a bad time to prune them down some? Thanks to your helpful tutorial, I now have lovely white geraniums blooming in my windowsill on this dreary January day!! I am going to share some with friends on Valentine’s Day. I took both cuttings and divisions of the plant. I found much more success (and blooms) with the cuttings. Thank you so much for brightening my winter windowsill!! I just found your website! Beautiful layout and clear instructions with gorgeous photos! I was wondering why my overwintering geraniums get yellow leaves at the bottom (usually) of the plants. I just pull them off, not a big deal since the plants always grow more shoots. The blooms are great color and brighten my environment two to four times during the cabin fever months. I have these in pots in an east window and water them once per week. I also have the glass water globes stuck in the soil, one or two per plant depending on its size. Do you think I’m giving them too much water? Or, maybe the window area is too cold during winter-time. We heat our home with electric heat and a wood stove. I am excited about reading more on your site. Especially about overwintering petunias, which I had no idea you could do until last year when an acquaintance mentioned to me that she does it every year. My only problem would be space if they need a lot of light. Thanks for the great tips! Just read through your geranium tutorial. I am looking forward to using these steps mid august. My only question is: once the geranium is cut back etc and re potted in August, do you keep the plants outside, or bring them inside. Hi Laura – Yellowing leaves can be the result of several factors, including too-low humidity, too much or too little water, not enough light, or a lack of nutrients. In your case, I suspect both desert-dry air and over-watering. Provide moisture only when the top inch of soil looks and feels dry (stick your finger in the soil to be sure). To boost humidity, I’d set the plants on a tray of pebbles and water. Hi Susan – Here in (cold) zone 5-b, zonal geraniums are not hardy. Consequently I bring them indoors in mid-September. Thank you for this post. I have four ancient (15+) years old mother geraniums. I have successfully grown many plants by cuttings from these four. I have several rooting right now. However, these four ladies needed to be propagated and I knew there was a method but I had to really search for your site. You described it exactly as I remembered it. Since I live in NM and receive plenty of winter sun, I too overwinter my plants. Thanks for refreshing my memory. I have done this several times and it does work. I have geraniums that get super tall and gangly, and cutting them down and repotting them gives me lots of new plants. I have found though that housebound geraniums do not do well being put back outside as they get acclimated to sun exposure and regulated temps. So once I bring them in, in they stay. A day late and a whole pile of geranium cuttings short! I couldn’t figure out what I had done wrong when my cuttings all rotted, but obviously letting the bottom scab over was a step I didn’t know about! However, I do NOW and I have all sorts of plants I bought this year that will be donating cuttings for attempt #2! I haven’t too much space in the house for larger plants near windows, but I want to use them for next year, rather than start over with all new plants. Minimal flowering is ok as long as the plant lives. As usual, Kevin, you are a life saver for those of us on limited gardening budgets, trying to keep our plants alive (fighting fungus with milk is on this afternoon’s agenda) or create new plants from those we have (I am drowning ~ delightfully ~ in African Violet ‘plantlets’, thanks to your tutorial). I also have a new window shelving unit (copy cat that I am) that I built which has brightened up my blah center dining room window now that it is FULL of blooming African Violets! What would I do without you?! Thanks so much Kevin! Hi Kevin, your tutorial for the geraniums is really helpfu,I have geraniums that were bought in1988 that still bloom. From the two I bought I made eight new plants. The old ones get leggy and don’t produce many blooms, still I take them indoors in winter, and keep them in a sunny window. This time I am trying your method, cutting the root ball in half and rejuvenating the the old uglies. This year I bought two orange ones that are new, and are beautiful.I shall try propagating more of those much to my husband’s consternation, we live on the outskirts of Montreal, the summers are too short, but I bring in lots of plants indoors, keeps me busy and happy in winter .this year I have caladiums and a big beautiful colius grown from a cutting from my friend’s plant. I do not have a big window garden like yous . By the way it looks lovely andthe plants seem happy, what is that little blue plant on the bottom shelf? I have always wanted blue in my garden, but the blue perrienials are too short lived. Iwant some plant that will bloom all summer long. I guess that’s it. Thanks for your blog, I do enjoy reading it. Please also later on post something about roses. This year was not so good for my roses. Thanks and bye. Hi Veez – Blue plant on the left side of the broad sill is hydrangea. Tricky to grow indoors, since it demands water every time you turn around! Good luck with your geraniums! Hi Kevin so happy to see that you answered my question. Thanks for naming the blue plant. Iwould not have thought it, as it is so blue , almost indigo blue. I must tell you some time about my never blooming ‘endless summer’ hydrangea.bye now. A friend gave me a hanging geranium at the beginning of Fall 2013 to try to see if I could try overwintering it in my sunroom. I was successful much to my delight and surprise. It had blooms all winter and in late March, it was nice enough to move it to the outdooors. I hung it up on a shepherd’s hook at the back of the house where it gets morning and early afternoon Sun and is somewhat shaded at certain times of the day by a dogwood tree. I hung my spider plant on a limb of the dogwood and it did exceptionally well too and has lots of new babies. I took some cuttings off the geranium last evening, got some fresh potting mix and this afternoon, plan to plant them. Seeing your tuitorial, I will be cutting back the Mother plant like you showed. I assume that will continue to develop foliage and flowers during the winter months. Why do you suggest a clay pot, why not plastic? What is the smallest size clay pot that I can start the cutttings in? I do have a few of them but they are small, like maybe a 1 c. size. or maybe 1/2 c. Can I mix some osmocte in the potting mix when I plant the cuttings instead of going out and buying the product you suggested? I don’t have storage space for any more gardening supply products. Now do you have a tuitorial on how to raise Christmas or Holiday cactus? I am about to give up on mine. I think one of them has bloomed in last 2 years. What am I doing wrong? I would love to try growing african violets; at least I’d have some color in the sunroom besides the bright turquoise walls! 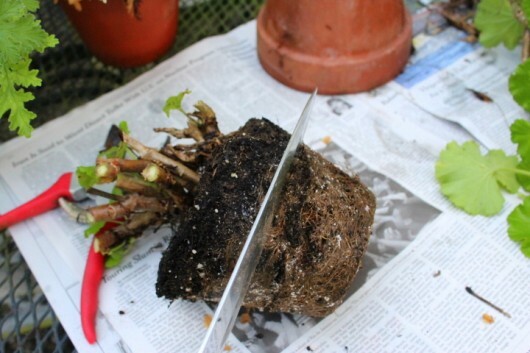 Hi Betty819 – You can start the cuttings in plastic or clay. I prefer 4-inch (10.16 c) clay pots. If your potting mix already contains plant food, you needn’t add osmocote or anything else until the geraniums are of flowering size. If you cut back the mother plant, just cut enough roots/foliage in order to return the plant to the same hanging basket, and fill in with fresh potting mix. You’ll find my Holiday cactus tutorial in this post: November Brilliance: The “Thanksgiving Cactus”. Thanks for your prompt reply. I have lots of 4 in. plastic pots, but I will wash/soak in bleach before using. I’ve been watching some YouTube videos on this same subject and they almost use the same or close to how you take your cuttings. 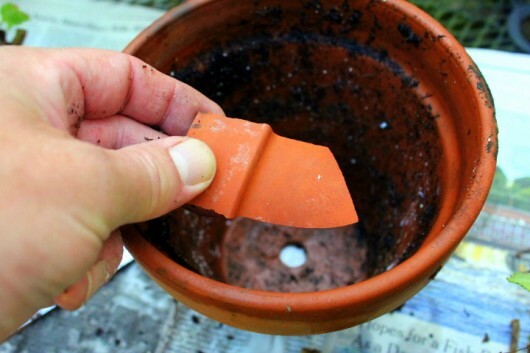 Do you think the clay pots hold the moisture better than plastic? My clay pots I have are way too tiny. I’ll see if Home Depot has any 4 in. clays/with saucers but don’t recall seeing any there yesterday but since I was mainly looking for the small bags of potting mix, I really didn’t pay much attention to pots. Will also check garden shop of Lowe’s and maybe Big Lots. Gosh, they are already putting Christmas stuff out in the Home Depot. Nothing like rushing the season! 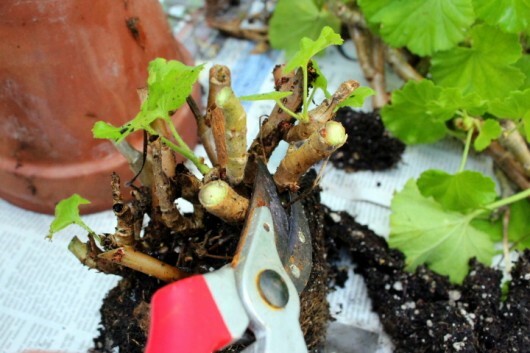 When you are cutting down the geraniums, do you cut down just as far as there are leaves? Mine are quite leggy because I wintered them inside last year without doing any trimming. I am looking at them to cut them back, and the lowest leaves are still quite high up. Should I cut lower and just leave stems if they look like they have nodes low down, or do they need leaves in place for growth? And, if I leave them long, should I pinch them back to get them a little more full again? I am having some success with the geraniums I cut back. However, a question about the leaves. I planted a leaf per your instructions. The leaf is not in good shape, but when I gently pull on it, it seems to be stuck well in the soil, as if it has roots. I haven’t seen any new growth yet though. It’s in a window that my violets love, but as it’s winter, it doesn’t get a super amount of sunshine. Do you think it will grow once it warms up and the sun is out more? Thanks, and Happy Holidays! I have 3 large geranium in my Cold garage for the winter (central Al). Is it too late to cut back the roots and reset the plant as you suggest? It is almost January but we have a projected colder and longer winter here. I had cut back the plant but not as drastic as you suggest and I did not trim the roots back at all. They seemed to have already gone into a dormant state but recently started putting out new growth. Very leggy too. Was wondering if I could still do what this article suggests or will I be stuck with the Giants till next year. for me i don’t think all thats necessary to do. unless im getting cuttings from it.. i know this one guy that has had a geranium for 7 years with out cutting on it and it still looks the same but now is like a small bush or shrub and is just growing well in the spring and inside in the winter months..
anyhow i need to pollinate mine so i’ll get seeds from the flowers i’d like to start a new plant from seeds not just cuttings. also i noticed that these flower plants don’t like alot of wind like from a fan plus they do like alot of light they don’t like water misting on the leaves but do in the soil around the stems mine have red flowers. because i think they would like to have a geranium flowering plant. i found the one i have on a sidewalk just was a 4inch broken limb i thought it was some kind of succulent ground cover plant and took it, then found out its a geranium. After an mishap rendezvous with our pot belly pig, i have only one surviving geranium instead of a dozen…i am going to use your method & make startlings out of the cuttings. Is there any chance the trimmed off root mass would grow if it was planted with new potting soil above and below it? Or could it be divided and planted in several pots, or must one have the green leafy cutting to absorb sunshine? They winter over just fine here, but it might be fun to use this method for a little happiness in the window through the winter months… Thanks. For potted cuttings of many types, I rely on vented plastic bags, positioned as humidity domes. My failure rate has been reduced enough to convince me they are valuable. Your winter window is an eye-popper and must give you great pleasure in the cold months. Thanks for posting this timely tutorial. Kevin- my geranium (1st 1 ever) is covered with beautiful flowers. I’m in western Mass. Is this really when I should chop it up? Thanks Kevin! I have attempted to root geraniums and always fail. Now I know to let them ‘callus’ first. There’s nothing so cheerful as blooming geraniums on a winter windowsill! Enjoyed this and I’m going to give it a try. Everyone, wish me luck! A WONDERFUL source of scented geraniums is Well-Sweep Herb Farm in Port Murray, New Jersey. They have more varieties than you ever knew existed — and of herbs as well, of course. I have ordered from them several times (most recently five years ago) and their plants have always been well grown, properly labelled, nicely packed, and promptly shipped. Their website — wellsweep.com — has a notice saying that unfortunately they cannot ship plants to AZ, CA, OR and WA, which is unfortunate indeed for folks who live in those states. You have to download their print catalog because there’s not a searchable online catalog, and while the catalog is not colorful with lots of pictures — it is essentially a list of botanical names with descriptions in table format — it is still a pleasure to browse through and is the best source of herbs (and scented geraniums) I know of. Scroll down through the catalog to Pelargoniums – Scented Geraniums, and prepare to be AMAZED. Kevin, do you think that this technique would work for ivy geraniums? Love this post. Have told many about it. my own. However, if you say this works, I’m going for it! Good tutorial – thanks much! So, are you considering ideas for getting going on a gardening book? Hope so! Cool post! 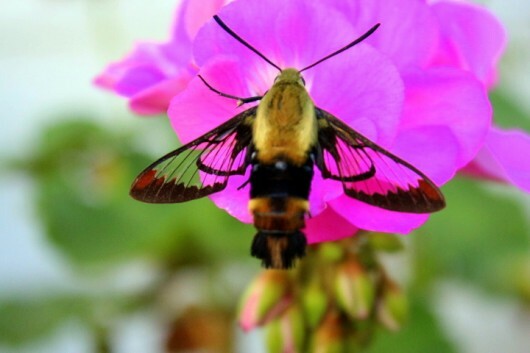 I love humming bird moth’s. I don’t however love their larvae, the tomato horn worm! Course the chickens don’t mind playing “rugby” with them. Thanks so much for this tutorial! I have never successfully brought my geraniums indoors for the winter. I’m going to re-pot those suckers today! Kevin- I have been wanting to do this for 2 years! Today, I am going to do it. I have three huge geraniums, nurtured through 3-4 winters, that need to be tamed and revitalized. Thank you SO much for the detailed directions. I love your whole blog. So many times, I think to myself that yours is the most useful blog I read. I love your humor and your penchant for knowing what to write about, how to share your knowledge in a fun way. If I sound sappy, I’ll attribute that to a rainy afternoon and some good chardonnay. So far, I have made the broth for Scotch Broth, 2 pumpkin pies from a volunteer blue hubbard squash and 4 loaves of pumpkin nut bread. After we eat squash or pumpkin, I throw the seeds all over our yard, ala Johnny Appleseed. What a blessing it is to find a new seedling! Cheers! And thank you! Kevin, I have been growing geraniums for years now here in SE Colorado out on the plains. In fact I had the screened-in porch on my 113-year old home converted to a sunroom with extra-wide sills to house my geraniums, along with a 7′ tall umbrella plant, 5′ tall corn plant, blooming impatiens and begonias and assorted smaller green plants.. My windows have a south and west exposure partially shaded with huge old elms. I usually slip them in jelly jars full of water, using marker over scotch tape on the sides for labels. Three days ago, I finally hauled in my 45+ geraniums from outside where they were vacationing, still in their pots. I have been looking all over the internet and stumbled across your blog. Finally, I found someone who knows what to do with my spindly, leggy, woody plants that I can never bear to throw on the compost pile! I was so happy to read your clear, precise instructions with those fantastic pictures, I broke into my happy dance! Yea! (I’m nearly 70, but I can still dance.. when no one’s looking!) 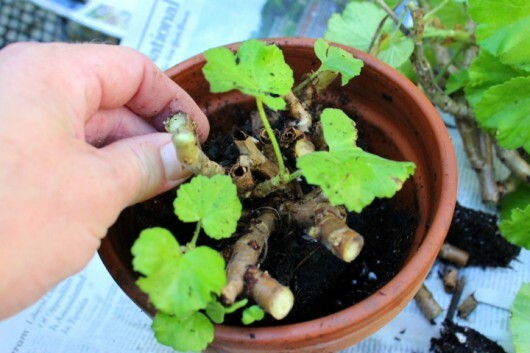 You inspired me to tackle the huge task of repotting my geraniums and slipping them. I still shy away from putting my slips in soil. I never have good luck with that. I take 3-4″ cuttings (sometimes more on leggy ones), stick them in their assigned glass to harden over for a day or two and then fill them with ordinary tap water. I place them next to the mother geranium and wait. If they root, fine, if not, okay, too. I try to buy new geraniums each summer if I see an unusual one to replenish my stock, but I have my old favorites. Now, they can be reborn again! Thank you, thank you! I have put you on my desktop, so I can read more of you. I read you’re an excellent blogger. I can’t thank you enough, Kevin! I am now in my second day of pruning and re-potting all my 4 doz.+ geraniums per your instructions. I have cut some of my leggy, woody ones almost to the soil, so some have only 4 or 5 brown stubs (with green showing on the cuts). I am now fearless in scooping the geranium out of its pot, scraping 2/3 of the old soil and piling it next to my roses, ready to use to cover them after the first hard freeze. I am tossing old stems, leaves and roots to my compost pile. I have trimmed the roots, like you said. I’m repotting them in Miracle-Gro moisture-control potting soil, as I sometimes don’t get around to watering them until 2 weeks have passed. I try to water all my plants every Sunday. I’m wondering if this soil will keep them too moist. I like the fact that it has fertilizer it it and is supposed to keep them fertilized for up to 6 months. It’ll make watering all of my houseplants much easier. I have to use 20 gallon milk jugs full of water and I used to use 1/4 tsp. Miracle-Gro Bloom Booster flower food every week or so. I also add 1/4 tsp. Super Thrive. What do you use to fertilize your geraniums, Kevin? I’ll try to keep posting progress of butchered geraniums. Ha! HI Ruth – Sounds like you’re becoming a geranium-rejuvenating pro! 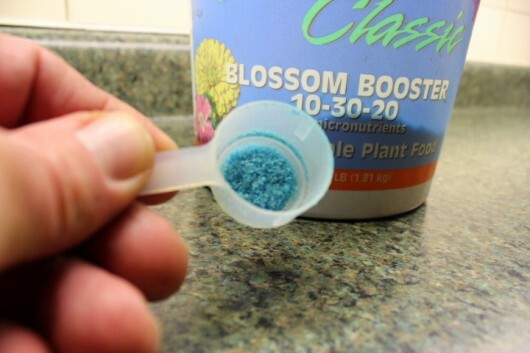 To answer your question, I feed my plants with Jack’s Classic Blossom Booster (as described in the article above). Have fun with your project! Kevin, where have you been for the past year? You don’t have any reply’s to questions about overwintering geraniums posted for the past year. My question is the same as #59, Meg 11-5-14. I live in Wisconsin. We haven’t had a hard freeze yet, and it doesn’t look like we will for at least a full week. I still have a Delphinium, a Rose mallow Hibiscus and a Columbine in pots. (Don’t ask) Is it too late to plant them outside? If so, is there a way to over winter them to plant next spring? I wish I could share pictures of the geranium plants that I have grown from using your method of taking a huge plant and planting all the ends. I started out with about 25, but through attrition now have about 15-18. I can’t wait until summer! Thank you so much for the tips on how to do this! Well, I guess I could put the pictures on my website – if I can figure out how to do that! Kevin- do you have any suggestions for Martha Washington geraniums- they are so beautiful in the greenhouse that I can’t resist buying them, but within a very short time they cease blooming altogether. Leaves are healthy, but no more blooms. So disappointing! Any way to encourage more blooms? Thank you, Kevin, for sharing. I love geraniums. Yours are so beautiful. You are such a wonderful inspiration for me. Thanks so much for all these great tips and explanations! I’m hoping to try this myself in a month or two. Thanks for the tutorial. This is the first year I haven’t killed mine. Will be trying your suggestions. You always have the best gardening ideas! Thank you so much. This past spring we used your technique for preventing weeds in our front garden bed. This area has the worst weeds ever! Using your technique, we have not had one weed so far this summer! My husband is thrilled as am I. Thank you so much for your wonderful information. Just love it! 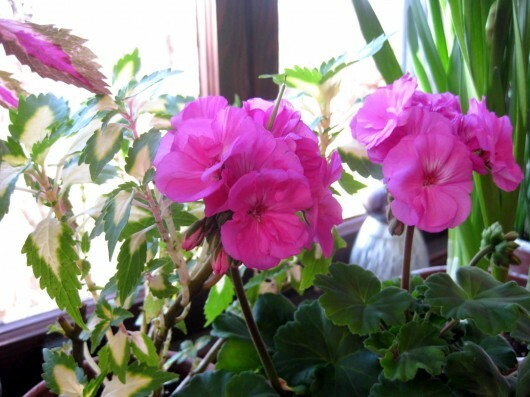 Kevin, I was so glad to read your post on the overwintering and care of zonal geraniums. I got married this past July and had used geraniums that I had grown from seed for our table centrepieces. I will use your method to keep my beauties alive and healthy; do you think they would do well in my greenhouse instead of inside the house? I think Husband worries that our house will be overtaken by plants! Thank you again for your blog – it is one of my top ones to read! Just recently signed up to your blog and ADORE it! Something to look forward to each weekend. Tried your super-easy, mega-delicious Blueberry Peach Cobbler last week with great success (thanks). Never realized you could scent milk for baking with scented geraniums!! Wow! –>Seeking rose-scented leaves now 🙂 Armed with your helpful instructions, I’ll be cutting up my pelargoniums in the next two weeks too. Again, thanks Kevin! Your re-post of this article gives me a chance to thank you again for it. I used your method last year, and not only were the geraniums absolutely gorgeous indoors all winter and spring, but they are beautiful in the garden this summer, too. Your inspiring instructions never fail for me! Many thanks Kevin for the post on extending the season for pelargoniums. I bought a number of the scented leaved varieties this spring; the oils evaporating in the evening air (a warm spell in this part of the UK!) is heavenly. I really want to keep them going through the winter, a problem in the past, and it is always nice to have young plants coming on as well. happy to have more of this particular favorite – so, thank you for your good advice! I posted in October 2015 that I was going to try your method. I did about 30 cuttings of three different types of geraniums. Out of those, I would guess that I had 20+ that made it. I’ll be doing this again, for sure! It was like having free plants! Thanks again. aaahhh Kevin!! thank you thank you thankyou…..love getting your newsletter. I am a geranium lover….I must have about a dozen or more big pots of them all around my place here in Kitchener Ontario Canada. now I finally know how to do my geraniums properly for the winter…Last year I trimmed them and cleaned them up …then into the fruit cellar with them. Oh they were ok but very slow to get started in the spring/early summer out doors. OH I should tell you this—you know those “suckers” that form when the plant is looking for light? I took them all off the plants and put them in water…..and they rooted and grew into the most beautiful hugh geranium !! Of course the pot was quite big and bloomed all colours because I had removed all the suckers from all the plants, therefore various colours. Some of my plants are 4-5 years old….I have managed to keep them going by trial and error….but now you have set me straight. Growing up, I always remember plants all around me..in the home, outside. Beautiful gardens along the house and separating one part of the yard from another. My mom had such a green thumb and being a member of the garden club, she had alot of garden ‘stuff’ and pretty things. When I married, I moved across country but always figured that her gardening things would be passed down to me. Ohh the vases! Thru the years, she became forgetful…and stopped watering her plants…and the houseplants were all gone the next time I came home. Just like that. In so many ways, I thought I would never regain what I had lost and though it’s not the same as having my mom’s plants, you are the first person I have actually thought of that can help me replace some of the things, some of the sentiments, some of the charm that I lost in her. Gardening is a funny thing, isn’t it? I’m not sure you can even understand what I am trying to tell you so I’ll just have to say, Thank you…from the bottom of my heart, Thank you. I think she would have adored you. Hi Sanna – Thanks for writing. Indeed, I’m sure I would have adored your mother! Kevin, if you are still reading this thread, is it too soon to be taking cuttings from a scented geranium in early Feb? I missed the end of last season you recommend in this excellent blog. I just pulled my two plants inside for the winter and they’ve recently started growing abundantly, but I’d like to take cuttings (to make more plants! also one of them is really lopsided) before full-blown spring. Is it too late? Thanks. Happy Valentine’s! Hope the soufflés are as yummy as they looked in your video! Sounds like good advice for geraniums. I’ve overwintered them semi-successfully in their pots for years, but this year tried advice of a friend by taking them out of pots & bagging them. plus soaking them every few weeks. They look pitiful now so hope I can revive them. Any further tips? Thank you! 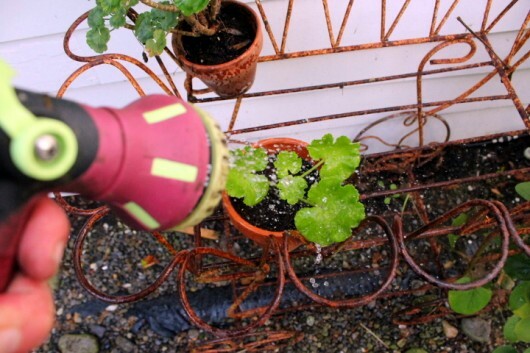 I tried this process at it works so well; my geraniums are beautiful, in flower and looking very healthy. I am keeping this great advice for future reference and passing it on to friends. Kevin, your blog helps satisfy the propagation freak in me….thanks for the great tips…now I just need a south facing mansion for all my pots. Another plant I love that is perfect for a small house is Oxalis – goes dormant when not watered and can sit in my cellar through the winter. Thanks for the great info. I’m going to try to overwinter my geraniums for the first time. I love your page Kevin! You have definitely been the role model for Delicious Living. My geraniums thank you for this one. Such a simple plant and yet they are so generous with their beauty. I have always loved them. Keep up the good work. You are touching many lives and beautifying many gardens. Continued Love Peace and Joy to You! Hi Robert – Yes, like Dorothy in Oz. Amazing! 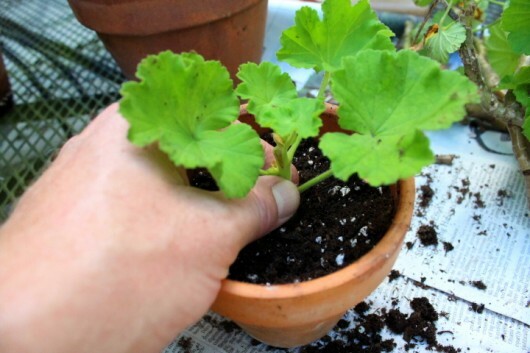 As for geranium and other cuttings, you’ll know they have rooted when new leaves appear on the stems. Thanks, Kevin, for reposting this valuable article. I’ve been nursing along some tired-looking zonal geraniums for several years. You’ve given me a few new tips. I will give these poor anemic, leggy girls one more try by cutting them back drastically and performing that severe root amputation you described. Hopefully they will survive the surgery and I can propogate new ones. 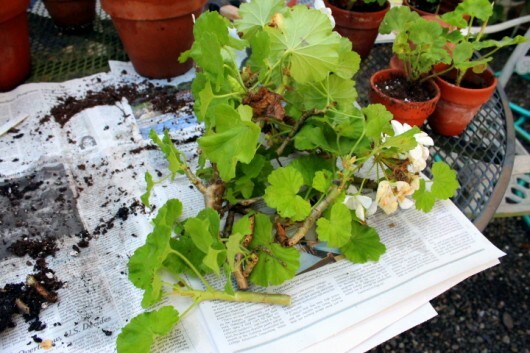 In your experience, how long do you keep senior geraniums before sending them to the compost pile? Kevin you are so wonderful to keep this blog. I saw last week’s blog post and started petunias, a couple of top growth geraniums from outside, and a few calibrachoa in small pots. Last winter a petunia or african violet was in bloom for virtually the whole winter making us smile daily. Today I took the lanky non blooming geraniums and cut them back and by cutting the roots knew this was going to make the best geraniums for my south facing windows this winter. Next I’ll do the scented geraniums. Since learning that they are rare I bought my favorites: True Rose, Lemon Prince Rupert and a Lemon Rose one. They are so wonderful and will look better and grow better for the pruning. Thank you for this well-timed post with such great directions. I have switched all my fluorescent lights to LED lights. I get excellent results on my ‘plant wall’ ( a five shelf wire rack from Costco. Got the LED shop lights there too). You get WAY more lumens of light for much less electricity. I bought a Christmas light timer that turns everything on at 7 am and off again at 9 pm. My overwintered plants thrive as do my tomatos and peppers I start on the same rig. I love it! Thank you Kevin for the tips on how to do geraniums these are my favourite plant & I have one which is called Rose Geranium – it is white with pink frilly edges it looks like tiny rose buds just beautiful – I hope I can keep it over the because this one is hard to come by. This is all so interesting and I will try the cuttings on my one red geranium this year. I also have one the man at Lowes called Austrailian Geranium. It is white but really doesn’t look like a geranium. It was on sale for $1.00 each. I bought 2 and gave one to my neighbor. I’d love to save it through the winter. I better do it tomorrow as it is September 4. Thanks for all your information. Have enjoyed your website for several years. Love your blog, Kevin. It’s always brilliant. I have geraniums that live inside, in my dining room window year-round. They are getting leggy, so I like the idea of cutting them back. If I cut them back do I necessairly need to cut the roots? I read one time, when the nights drop to 50 degrees, bring your plants inside, this will help with the dropping of leaves, which they so often do. I also read once that in the old days when pencils were made of cedar, housewives or husbands 🙂 poked the pencils into the dirt a couple weeks before they brought the plants in to get rid of the gnats. One could use cedar chips I would think. One last thought for you, I have many times rooted my geranium stems, in water, that works pretty good too. Recommendation for those doing the same with petunias: soak the new potting soil so it is good and wet, and keep watering it well for the first 2 weeks while the plant snips adjust to being on their own and not part of a big plant. Also, use the end tip of the cutting, meaning, don’t cut off the blossom end and stick in a middle part of stem and expect good results. The growing part of the plant is the tip (the apical meristem is what generates new plant growth). DO pinch off all flowering buds. You don’t want this little snip to work at flowering … you need it to ROOT. Yes, cutting the old roots off is important. Add new soil so the new roots have new material to grow into. Kevin, this was so much fun! All my little geraniums are lined up on my southern window sill….can’t wait for them to bloom. The pictures and explanations were so clear and concise. Fantastic job! Thanks so much! Thank you so much for this wonderful tutorial, Kevin! All my little geraniums are lined up on my dining room windowsill, and doing well. This was so much fun! Some of the plants are sending up buds to bloom already. I love your website. Everything is just lovely and so beautifully done. I appreciate this clear tutorial and will follow this method come August. But how do I prepare my leggy geraniums for going back outside this spring? (They loved their indoor setting with light from the east, south, and west and grew profusely.) Should I follow the same method of cutting them way back and repotting them with fresh soil? Thank you. I have over-wintered geraniums with great success. Now today someone handed me a bunch of cut geraniums, with big flowers not in a pot, just cut like cut flowers for a vase and said I could just stick them in a pot with earth and they will grow. I can’t see how this could possibly happen but I didn’t want to insult her by saying I’ve NEVER ever heard of being able to do this. Is this possible, Kevin? Hi Mary Elia – You are indeed correct. And very polite. I stumbled upon your website while searching for window garden information. Wow, I’m so glad I did, you have so much information regarding houseplants, care tips, propagation, and how to water that I am kicking up my heels! Your photos are fabulous and explanation of each step so easily understood by someone who sometimes has issues reading instructions (the photo’s help!) that I can buzz right through and not have to reread something I may have missed or not understood. Thank you, thank you! I look forward to reading even more of what you’ve so kindly shared with everyone. I will be using your site again and again! Now to get propagating! It’s already beginning the second week of September here in NH and the nights are cool, but I’m still going to try my hand at cutting back my geranium and rooting the cuttings. I’m really hoping to expand my collection indoors. We hope to have a plant window added over the kitchen sink in our home before Thanksgiving, I’m so excited! I love the plant window you created for your own home, I may have to try that one out on some other windows!